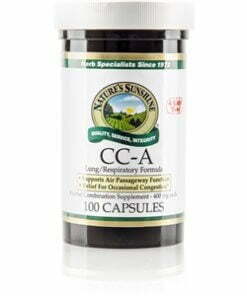 Nature’s Sunshine CC-A nourishes the circulatory and immune systems as well as providing respiratory support. This herbal blend includes capsicum for circulatory support; goldenseal, sage, and rose hips for immune support; and yarrow for respiratory support. 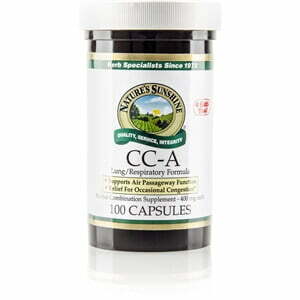 CC-A also contains vitamins and trace minerals. Instructions: Adults: Take two capsules with a meal twice daily. Children: Take one capsule with a meal twice daily.